Posted on October 26, 2017 at 9:25 am. 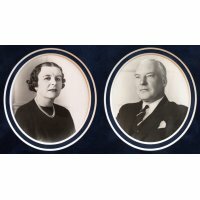 Born in Conisbro’ on 11 April 1899, the only son of sickle manufacturer William and his wife Mary Harriet, of Burcroft Villa, and following two years at Hallgate School, Doncaster (Ms. Jackson’s Private School), Bill was accepted as a boarder at King Edward VI. Grammar School, Retford, in September 1913. A keen sportsman – playing for the School’s 1st & 2nd XI. football and 1st XI cricket teams – he was also a Prefect. However his talent as a piano player was soon apparent, and he participated in the School Orchestra for many concerts. 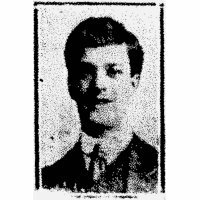 This proficiency showed, as he passed Incorporated Society of Musicians’ examinations in Sheffield, before leaving in September 1916 to attend Sheffield University as an engineering student. Joining the University’s Officer Training Corps, he received a “call-up,” attested in Doncaster as a Private in the West Yorkshire Regiment in February 1917, and was immediately transferred to the 5th Reserve Battalion. Indicating that he was trying to get into the Royal Flying Corps, but feared that his eyesight may be against him, it was not to be this issue which ended his military service. In May 1918 Bill was finally mobilised, and presented himself at the West Yorkshire Regiment’s Reception Depot in Leeds. However, frequent fainting and hospitalisation led to a Travelling Medical Board examination, who wrote that he “Has always been troubled with breathlessness on exertion, during civil life, but this was more noticeable when in OTC at Sheffield. [Since call up] could never do parades because of pain & breathlessness.” They determined that this was due to heart problems, and he was to be “Discharged as no longer physically fit for war service.” A subsequent Pension Board determined that, while the condition was not due to service, it had been aggravated by such, and, eventually discharged him on 2 November 1918, awarding 13 weekly allowance of 8s 3d. Returning to Doncaster, he married Irene Smales in 1925, and they had 2 daughters. Living at 69 Thorne Road since at least 1931, Bill became a professional musician and as a Licentiate of the Royal Academy of Music (LRAM), provided music lessons from his home, in addition to being organist at Nether Road Church and musical director of the Doncaster Thespian Amateur Operatic Society.